The Mobile Launcher Platform (MLP) is one of three two-story steel structures used by NASA at the Kennedy Space Center to support the Space Shuttle stack throughout the build-up and launch process: during assembly at the Vehicle Assembly Building (VAB), while being transported to Launch Pads 39A and B, and as the vehicle's launch platform. NASA's three MLPs were originally constructed for the Apollo program to launch the Saturn V rockets in the 1960s and 1970s, and remained in service through the end of the Shuttle program in 2011 with alterations. The Space Launch System rocket will be mounted atop a renovated platform. The MLP was constructed for transporting and launching the Saturn V rocket for the Apollo program lunar landing missions of the 1960s and 1970s. Each MLP originally had a single exhaust vent for the Saturn V's engines. The MLPs also featured a 120-meter (380 ft) Launch Umbilical Tower (LUT) with nine arms that permitted servicing of the vehicle on the launch pad, and swung away from it at launch. After the Apollo test program, Cape Canaveral Launch Complex 37 was decommissioned and launches of the Saturn IB rocket were moved to Kennedy Space Center Launch Complex 39B for the Skylab and Apollo-Soyuz programs. MLP No. 1 was therefore modified to add a 43-meter (140 ft) four-legged pedestal (nicknamed "the milkstool" because of its resemblance to the stool used by farmers when milking cows by hand) for the shorter Saturn IB to stand on. 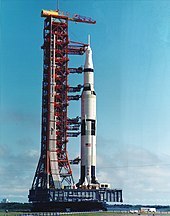 This allowed use of the Saturn V tower and service arms for the Saturn IB, and Saturn V Ground Support Equipment (GSE) was removed or de-activated and Saturn IB GSE equipment was installed. After the Apollo program, the launcher platforms were modified for the Space Shuttle (Space Transportation System). The umbilical towers from Mobile Launchers 2 and 3 were removed. Portions of these tower structures were erected at the two launch pads, 39A and 39B. These permanent structures are now known as the Fixed Service Structures (FSS). The umbilical tower from Mobile Launcher 1 (which was the platform used for the most significant Apollo missions) was taken apart and stored in the Kennedy Space Center's industrial area. Efforts to preserve it in the 1990s failed, however, for lack of funding and it was scrapped. In addition to removal of the umbilical towers, each Shuttle-era MLP was extensively reconfigured with the addition of two Tail Service Masts, one on either side of the Main Engine exhaust vent. These 9.4 m (31 ft) masts contained the feed lines through which liquid hydrogen (LH2) and liquid oxygen (LOX) were loaded into the shuttle's external fuel tank, as well as electrical hookups and flares that were used to burn off any ambient hydrogen vapors at the launch site immediately prior to Main Engine start. The Space Shuttle main engines (SSMEs) vented their exhaust through the original opening used for the Saturn rocket exhaust. Two additional exhaust ports were added to vent exhaust from the solid rocket boosters that flanked the external fuel tank. The Space Shuttle assembly was held to the MLP at eight holddown points using large studs, four on the aft skirt of each Solid Rocket Booster. Immediately before SRB ignition, frangible nuts attached to the top of these studs were detonated, releasing the Shuttle assembly from the platform. Water is released onto an MLP at Launch Pad 39A at the start of a rare sound suppression system test in 2004. During launch, 1,100,000 litres (300,000 US gal) are poured onto the pad in only 41 seconds. When NASA began launching Shuttle missions, it became clear that the MLP might inadvertently pose a danger to the crew or the vehicle, due to the possibility of massive acoustic shock waves bouncing off the platform and hitting the Shuttle as it lifted off. This was true for the Saturn V launches as well, but there was less risk because the Apollo spacecraft, atop the 111 m (363 ft) stack, was much farther away from the engines. Because the Shuttle was about half the height of the Saturn, the crew cabin and payload bay were much closer to the platform, and much more vulnerable to the tremendous forces bouncing back off the MLP—on the first mission, STS-1, the shock waves damaged many of the protective thermal tiles. NASA's solution to this danger was to cushion the MLP at every launch with a flood of flowing water. Starting 6.6 seconds before engine ignition, a 1,100,000-litre (300,000 US gal) water tower at the launch site began dumping water down a pipeline and into the exhaust vents of the MLP. Next, six 3.7 m (12 ft)-high towers known as "rainbirds" began to spray water over the MLP and into the flame deflector trenches below it. The water absorbed some of the bruising forces of the acoustic waves, and discouraged fires that might be caused by the rocket exhaust. This water-dumping mechanism, known as the Sound Suppression System, emptied the launch pad tank in around 41 seconds. The giant white clouds that billowed around the shuttle at each launch were not smoke, but water vapor generated as the rocket exhaust boiled away huge quantities of water. The suppression system reduced the acoustic sound level to approximately 142 dB. Each MLP weighs 3,730,000 kg (8,230,000 lb) unloaded and roughly 5,000,000 kg (11,000,000 lb) with an unfueled Shuttle aboard, measures 49 by 41 m (160 by 135 ft), and is 7.6 m (25 ft) high. It is carried by a crawler-transporter, which measures 40 by 35 m (131 by 114 ft), and is 6.1 m (20 ft) high. Each crawler weighs about 3,000,000 kg (6,000,000 lb) unloaded, has a maximum speed of about 1.6 km (1 mi) per hour loaded, and has a leveling system designed to keep the launch vehicle vertical while negotiating the 5 percent grade leading to the top of the launch pad. Two 2,050 kW (2,750 hp) diesel engines power each crawler. Originally designated the "Mobile Launcher", the MLP was designed as part of NASA's strategy for vertical assembly and transport of space vehicles. Vertical assembly allows the preparation of the spacecraft in a ready-for-launch position, and avoids the additional step of lifting or craning a horizontally-assembled vehicle onto the launchpad (as the engineers of the Soviet space program chose to do). The Mobile Launcher Platform was set atop six legs, each 6.7 m (22 ft) tall, when stationary. The Solid Rocket Boosters were mounted on top of the MLP. The External Tank was then lowered between the two boosters and attached to them. After that, the orbiter was lowered into position and attached to the External Tank. The crawler-transporter then carried the combined platform and vehicle to the launch site, and deposited them there together. Once the launch was completed, the crawler-transporter retrieved the empty MLP from the pad to be readied for its next use. With the retirement of the Shuttle in 2011 and its planned replacement Orion spacecraft and launcher in the design and test phase, NASA converted LC-39B from Shuttle operations to support Orion launches. The Ares I-X suborbital mission utilized MLP-1, to support the stacking and launch operations. The cancelled Ares I-Y would have used the same MLP. The MLP that was built to launch the Ares I rocket will be modified to support the Space Launch System. The mobile launcher will have to be altered in order to support the heavier weight and additional thrust of the heavy lift rocket. The biggest modifications to the MLP will be on the platform's base, where engineers will increase the size of a 2.0 m2 (22 sq ft) exhaust duct to a rectangle stretching 18.3 by 9.1 m (60 by 30 ft) and strengthen the surrounding structure. The SLS will weigh more than twice as much as the planned Ares I rocket. The Ares I rocket would have featured a single solid-fueled first stage, while the Space Launch System will include two large solid rocket boosters and a powerful core with four Space Shuttle main engines. Renovation was completed in October 2018 and is currently in the Vehicle Assembly Building, with the addition of the tower. Early in 2016, NASA finished upgrading CT-2 to a "Super Crawler" for use in the Space Launch System program. CT-1 is now in the process of being modified to serve a variety of commercial spacecraft. In April 2016, Orbital ATK and NASA entered negotiations for the lease of CT-1 and one of the four Vehicle Assembly Building bays. ^ Roy, Steve (November 2008). "Space Shuttle Solid Rocket Booster: Frangible Nut Crossover System" (PDF). NASA. NP-2008-09-143-MSFC. Archived (PDF) from the original on February 2, 2017. Retrieved September 28, 2016. ^ "FAQ: Why do you drop water under the shuttle as the engines start?". NASA. January 5, 1999. Archived from the original on May 15, 2013. ^ Bektas, Metin (December 1, 2013). "Space Shuttle Launch and Sound Suppression". Metin's Media & Maths. Archived from the original on October 11, 2017. Retrieved October 11, 2017. ^ Stuckey, Jeff; Heiney, Anna (May 10, 2004). "Sound Suppression Test Unleashes a Flood". NASA.gov. Archived from the original on February 15, 2009. Retrieved March 6, 2009. ^ "Countdown! NASA Launch Vehicles and Facilities" (PDF). NASA. October 1991. pp. 23–24. PMS 018-B, section 4. Archived from the original (PDF) on January 27, 2005. Retrieved August 21, 2013. ^ "Countdown! NASA Launch Vehicles and Facilities" (PDF). NASA. October 1991. pp. 16–17. PMS 018-B, section 3. Archived from the original (PDF) on January 27, 2005. Retrieved August 21, 2013. ^ Dumoulin, Jim (October 6, 1993). "Mobile Launch Platforms (MLP)". NASA.gov. Archived from the original on August 28, 2013. Retrieved August 21, 2013. ^ Gebhardt, Chris; Bergin, Chris (February 23, 2016). "CT-2 completes Super Crawler modifications for SLS program". NASA Spaceflight. Archived from the original on April 30, 2016. Retrieved June 24, 2016. ^ Herridge, Linda (February 22, 2015). "NASA's Giant Crawlers turn 50 Years Old, Pivot Toward Future Exploration". NASA. Archived from the original on June 20, 2016. Retrieved June 24, 2016. ^ Powers, Scott (April 21, 2016). "Orbital ATK picked to use NASA's Vehicle Assembly Building at Kennedy Space Center". Florida Politics. Archived from the original on August 3, 2016. Retrieved June 24, 2016. Wikimedia Commons has media related to Mobile Launcher Platforms. This page was last edited on 25 March 2019, at 21:40 (UTC).